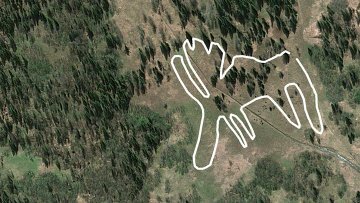 A massive geoglyph (carved figure in the ground) of an elk (moose) in the Zyuratkul Ridge in the Southern Urals may be the oldest such artwork in the world, perhaps dating back 5000-8000 years. It’s massive, over 2 km long and some 275 m across, and was made with large and small stones embedded in the ground and crushed stones. Stanislav Grigoryev of the Russian Academy of Sciences’ Institute of History and Archeology, said he believed that the elk was a message addressed to the gods. Of course, we know that this must be the holiest place dedicated to the Sibiryak Shape of Elk, a thin place where travel into the Otherworlds is easy. Secret: Mighty Antlers (The devotee can at will manifest great antlers, and while they are evident can use this Secret as an additional Affinity with the feats Attract Mate, Bone-Crunching Charge, Intimidating Display. The names elk and moose can be confusing, because they are used for different species in North America and Europe. What Europeans call elk, North Americans call moose: genus Alces, broad palmate antlers, very large, likes to feed on water plants, lives solitary, not in herds, found in forests, wetlands, meadows near same, prefers cool climates, probably not found south of the Pripet Marshes or the northern edge of the Southern Steppe. What North Americans call elk, or wapiti, is Cervus canadensis, a very close relative of Cervus elaphus, the red deer of Europe. These deer are social animals that prefer drier, more open habitats: grasslands, mountain meadows, and open woodlands, anywhere except the tundra and solid taiga. Both species were hunted, and so might be rare in populous places and open country. These animals are good to eat, and give hundred of kilos of meat, but are not easy to catch or kill. They are alert, fast, and have great stamina. An adult Alces can kill a wolf or a man with a single kick. They move with the seasons, following good forage and cool temperatures in summer, and sheltered browsing in winter. The statistics are amazing considering the size of the art..wondering how it was done as you dont get the perspective of the image while doing it. was the lines photoshoped?